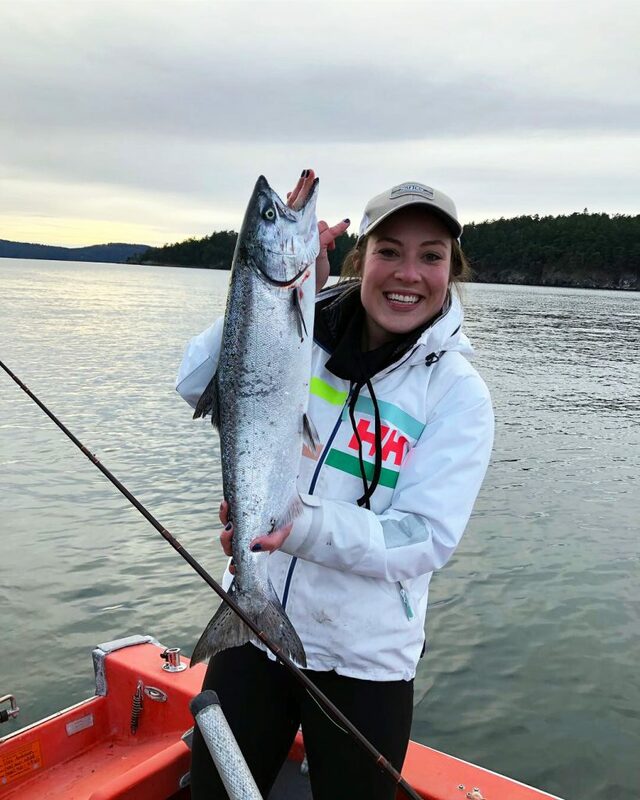 Kate Anderson of Seattle holds up a nice winter chinook she caught at Spring Pass in the San Juan Islands on the Jan. 1 when salmon fishing reopened. Area 7 is supposed to stay open through April 15 but could close if fish encounter rates are achieved sooner. Marine salmon anglers live in a new era where the amount of time on the water is dictated by going out sooner than later. As sport salmon fishery windows of opportunities in the winter and summer are now driven by fish encounters or quotas, I have always been one to sing the song of hitting it “quick and often” rather than waiting later in the fishing season to get your chances of time on the water. A prime example is what just occurred this past week, when WDFW staff revealed the central Puget Sound (Marine Catch Area 10) total encounter rate skyrocketed to a level that prompted them to close fishing after this past Saturday (Jan. 19) – the season was supposed to be remain open through March 30. WDFW staff indicated it was some of the best winter fishing seen in Area 10 for the past several years and unusually good weather during the first half of January was another factor for the early shutdown. It can be termed as the “perfect storm” coupled by excellent catch per unit effort, and anglers and fish sampled along with nice weather that tilted this in the wrong direction. Looking back at WDFW historical data all the way back to 2003 for the time period between Jan. 1-16 there was nothing comparable. WDFW preliminary in-season estimates of effort and salmon catch (released or kept) indicated the Area 10 total encounter guideline of 2,997 chinook was exceeded by 112 percent or 3,351 fish. A breakdown of the effort showed 141 boats with 316 anglers Jan. 1-6 kept 165 hatchery chinook and released 442 hatchery and 152 unmarked chinook for a total encounter of 759; 444 boats with 1,019 anglers Jan. 7-13 kept 459 hatchery and five wild (not good and ILLEGAL) chinook and released 1,230 hatchery and 418 unmarked chinook for a total encounter of 2,111; and 145 boats with 227 anglers Jan. 14-20 kept 105 hatchery chinook and released 280 hatchery and 96 unmarked chinook for a total encounter of 481. 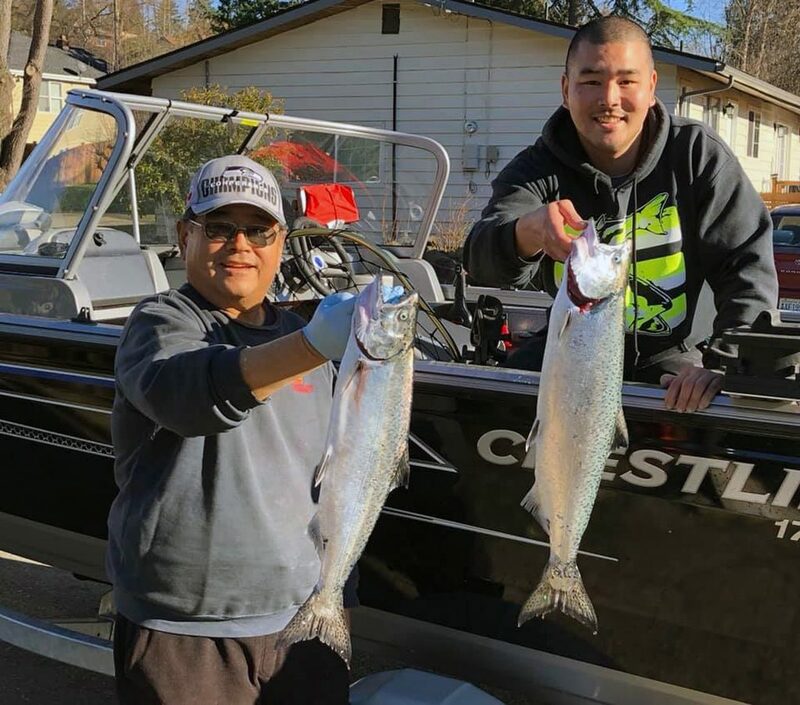 Marcus and Steve Nitta hold up a pair of nice hatchery chinook they caught in Elliott Bay on Sunday, Jan. 13 in the Tengu Blackmouth Derby which has been cancelled due to the closure of Area 10. The WDFW test fishery found the adipose-fin mark rate in Area 10 was 25 percent for legal-size chinook – the minimum size limit is 22 inches – and the overall mark rate was 50 percent. The closure also affected the Tengu Blackmouth Derby – the oldest derby in the Pacific Northwest that began before World War II – held in the winter, which has now been cancelled due to the Area 10. The derby started on Jan. 6 and was slated to be held every Sunday through Feb. 24. In Area 7 the best winter blackmouth – a term commonly given to chinook for their dark gumline – fishing has come from Clark and Barnes Islands; Sucia Island; Parker Reef; West Beach; Spring Pass; Thatcher Pass; Peavine Pass; Point Thompson; Obstruction Pass; Waldron Island; Lopez Pass; and Presidents Channel. The daily limit in the San Juan Islands is one hatchery chinook. In the San Juan Islands (Area 7) winter fishery can’t exceed 3,176 total unmarked encounters and/or exceed 11,867 total encounters, but just 8 percent or 859 fish have been encountered through Jan. 6. Another area dictated by encounter rates is the chinook fishery on the east side of Whidbey Island (Areas 8-1 and 8-2), which has a total encounter of 5,474 fish, and they’re sitting at 42 percent or 2,305 encounters to date. Areas 8-1 and 8-2 have a two-hatchery chinook daily limit. WDFW plans to provide regular catch updates at https://wdfw.wa.gov/fishing/reports_plants.html. Salmon anglers also got word late Friday from WDFW about the situation in northern Puget Sound (Area 9) that also opened on Jan. 1. For now it sits in the safe zone at 15 percent with 1,211 encounters and a ceiling of 10,004 chinook. Area 9 has a one hatchery chinook daily limit. I’ll bring up the notion that if you plan to fish Area 9, I’d go soon because you never know how long it will take for the catch to be gobbled up. Some of the best locations have been Midchannel Bank off Port Townsend; Double Bluff off Whidbey Island; Pilot Point; Point No Point; Possession Bar; Mats Mats Bay; Marrowstone Island; and Foulweather Bluff. Your other options for winter chinook are south-central Puget Sound (11); Hood Canal (12); and southern Puget Sound (13). Other important dates are Feb. 27 when WDFW unveils their salmon forecasts during a public meeting, 9 a.m., at the Lacey Community Center. Final seasons will be adopted by the Pacific Fishery Management Council on April 11-16 at the DoubleTree by Hilton in Sonoma, Calif. 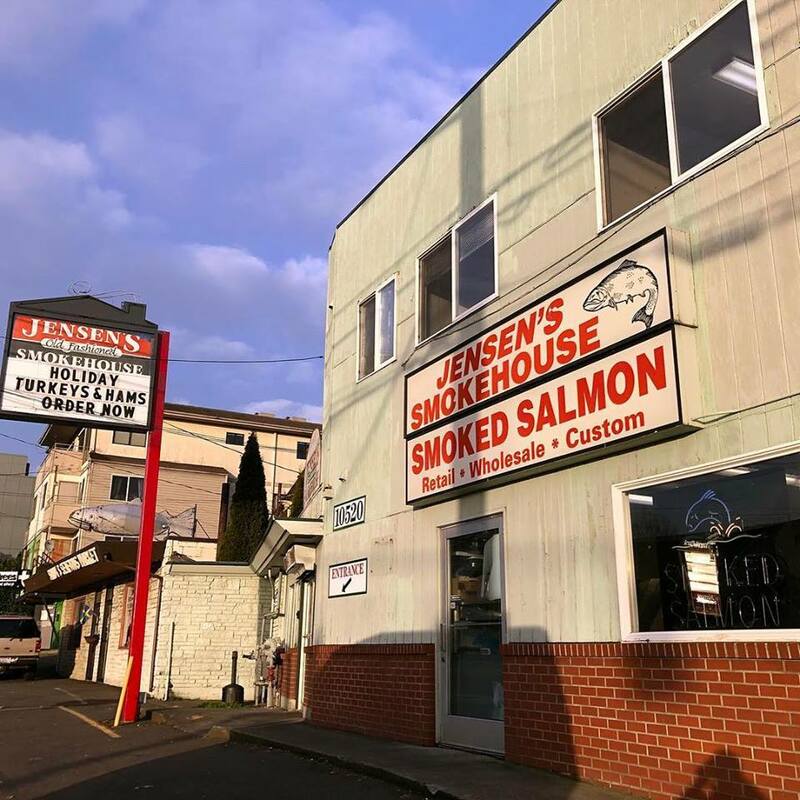 Many anglers have shuffled their coolers filled with fish through the doors at Jensen’s Smokehouse in Greenwood to be custom smoked.